Silent comedy buffs seek out Making a Living for one reason only: to witness the film debut of 24 year-old Charlie Chaplin, fresh from stage success in England and America with the Karno comedy troupe. Neither Chaplin nor producer Mack Sennett recalled this first attempt with any fondness in later years, but it seems neither much worse nor much better than the average Keystone one-reeler of the period. We watch with heightened interest, but Making a Living remains difficult to assess objectively. We're so conscious of it as a special milestone, as Chaplin's First Movie, that it isn't easy to sit back and enjoy the show on its own, admittedly modest merits. The first thing we notice is that the familiar costume hasn't been developed yet. In the very first shot, when Chaplin approaches his co-star (and director) Henry Lehrman to ask for a hand-out, it takes us a moment to adjust to his exotic appearance: he wears a top hat, tan frock coat, and droopy mustache. He looks a bit seedy but he's not exactly a tramp, more like an eccentric gent who is down on his luck. It's interesting to observe Chaplin in this extended opening sequence as he puts the touch on a man who is, apparently, a total stranger. He engages Lehrman in light conversation, examines the man's ring, briefly pretends to steal it, chuckles winningly, and then gets down to the business of genteel pan-handling. At first Lehrman refuses him a loan, but when he relents and offers cash Chaplin suddenly turns him down -- and then, as the offer is withdrawn, quickly grabs it. It's a nice little scene, more relaxed and nuanced than what we might expect. All that follows is more conventional, as it details the escalating (and increasingly violent) rivalry between Chaplin and Lehrman, first over the same girl and then over the same job, at a newspaper office. Along the way we recognize some Chaplin expressions and mannerisms familiar from later performances, but we also note that Charlie's character is decidedly unsympathetic: he's a con man who repeatedly double-crosses his reluctant benefactor, Lehrman. At one point during a battle Chaplin holds Lehrman at bay with his walking stick, as he later would with Eric Campbell in The Rink (1916), but The Little Tramp seems worlds away. Eventually, when Lehrman manages to take some photos at the scene of a car accident, Charlie steals his camera and attempts to pass off the photos as his own. What a scoundrel! For a newcomer to movie-making Chaplin appears perfectly relaxed before the camera. Despite all the scuffling and running around that takes place here, both Chaplin and Lehrman (who doesn't display much screen presence) give performances that are noticeably more restrained than the Keystone norm of the time. Towards the end, when Chester Conklin appears as a cop, his grotesque makeup and out-sized reactions look quite exaggerated in contrast to the two leads. It's also interesting to observe that Chaplin and Lehrman, who quickly developed an intense mutual antipathy off-camera, spend most of their on-screen time together as adversaries, both in this film and in Kids' Auto Race, made soon afterward. It seems that Chaplin was signaling, from the very outset, that he would not passively submit to direction from others -- or at least not from Henry Lehrman. 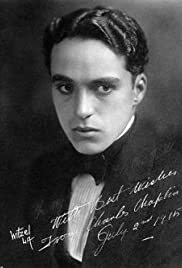 And it wouldn't be long after this, just a few months, before Chaplin would be directing his own work, and his brilliant career would be launched in earnest.